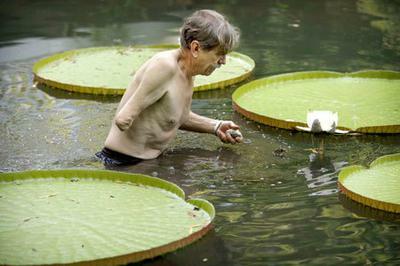 I had seen photos of giant water lily pads in a brochure for the 62 acre Kanapaha Botanical Garden many times. I was especially anxious to see them in person. 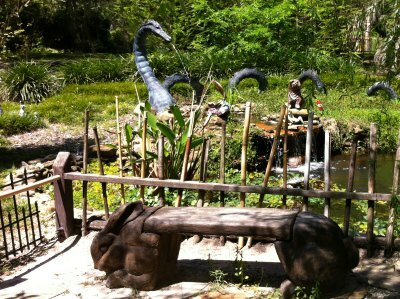 On a recent stay in Gainesville, the garden was on my to-do list. I picked up my map and headed for the cluster of small gardens, including a children's garden, butterfly, rose and bulb gardens. Small water falls, streams and bridges are scattered throughout the area. On the opposite side of the visitor's center is an area I personally found even more interesting. 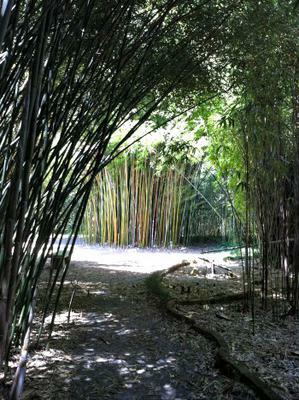 A marvelous collection of mature bamboo, with several different varieties was amazing. Then came the 'Native Woodland Trail.' It's an old natural area with sink holes, huge live oak trees and native wild grapes, with vines as big around as my leg. 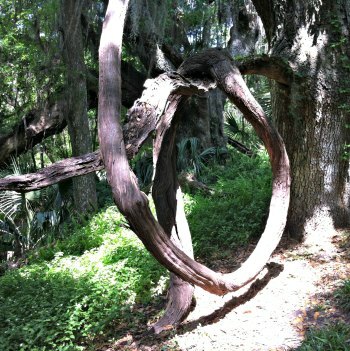 They were entwined around the ancient oaks and other old native trees. After walking for some time through this natural beauty, I arrived in an open area. Rows of bright white chairs were being set up for an outdoor wedding. What a fabulous location for such an event! I then followed another path into a more wooded area and came out at the lily pond. There were some small lilies, but I'm looking forward to my summer visit when I can see the giant lily pads that first attracted me to this lovely garden. The word Kanapaha is taken from two Timucua Indian words "palmetto leaf" and "house." The original residents of the area were Timucua Indians. They lived in thatched houses in a small village on the shores of the 250 acre lake they called Kanapaha. The lake is adjacent to the gardens. Although now retired, Don Goodman is still full of energy and very visible in the gardens. His daughter Alexis is the current director.